Note from editor: James Powell is known to many model railroaders because of his unique Wiscassest, Trevino & Western (WT&W) model railroad. For a while, James also ran a business making wooden building kits for model railroaders. To help folks dress up their buildings, James printed business signs out on thin sheets of wood that could be cut easily and pasted onto buildings. Unfortunately, the business didn't last forever. When James put up his TrevinoCircle.com web site, he posted scans of those business sign for other model railroaders to download and use. He also gave us permission to post them on our web site if we wanted to, as long as we pointed to his web site and gave him credit. We didn't do so at the time, because his site was still up. In recent months, however, the TrevinoCircle.com web site is no longer active, so we've taken James up on his offer to let us host these for our readers. The rest of this introduction and the large graphic files are all James' original work (although we've reformatted the preview files to make them more useful). Thanks again, James, for allowing us to continue making this resource available. Welcome to the WT&W ad sign exchange! From here you can download, for free, the same ads we use on our buildings on the WT&W! 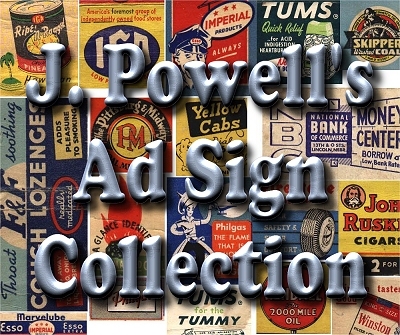 We have a huge library of ad signs from our former company, DP Industries. Instead of letting them all rot away in storage, we figured we'd share them all with you! Click on the thumbnail image to view the full size image. The full size images are very large, but in order for you to be able to print them out full size, they have to be. Note: For very fine quality signs, try downloading the big image, then reducing the size as you print them out. If you are working in a scale that will allow you to reduce the size of these signs by 50%, they should come out even better than they do now! Ad Sign #1 - Includes 13 signs. Click on the image to see full size. Right click on the big image and choose 'Save Picture As...' or 'Save Image as....' to save the image to your hard disk. Note: These images are large and will take a while to download on a slow connection. Ad Sign #2 - Includes 17 signs. Click on the image to see full size. Right click on the big image and choose 'Save Picture As...' or 'Save Image as....' to save the image to your hard disk. Ad Sign #3 - Includes 12 signs. Note: There is damage to the left side of this image. If you have a copy of this image without the damage, plase contact us so we can replace this image with a better one. In the meantime, most of the signs are still useful. Click on the image to see full size. Right click on the big image and choose 'Save Picture As...' or 'Save Image as....' to save the image to your hard disk. Ad Sign #4 - Includes 14 signs. Click on the image to see full size. Right click on the big image and choose 'Save Picture As...' or 'Save Image as....' to save the image to your hard disk. Ad Sign #5 - Includes 14 signs. Note: When I originally posted this page, the image from J. Powell's original site was corrupted so I couldn't post all fourteen signs. Thanks to alert reader D. Corcoran, we now have a better version with all fourteen images. Please click on the image to see the signs full size. Right click on the big image and choose 'Save Picture As...' or 'Save Image as....' to save the image to your hard disk. Ad Sign #6 - Includes 21 signs. Click on the image to see full size. Right click on the big image and choose 'Save Picture As...' or 'Save Image as....' to save the image to your hard disk. Ad Sign #7 - Includes 14 signs. Click on the image to see full size. Right click on the big image and choose 'Save Picture As...' or 'Save Image as....' to save the image to your hard disk. Ad Sign #8 - Includes 16 signs. Click on the image to see full size. Right click on the big image and choose 'Save Picture As...' or 'Save Image as....' to save the image to your hard disk. Ad Sign #9 - Includes 25 signs. Click on the image to see full size. Right click on image and choose 'Save Picture As...' or 'Save Image as....' to save the image to your hard disk. 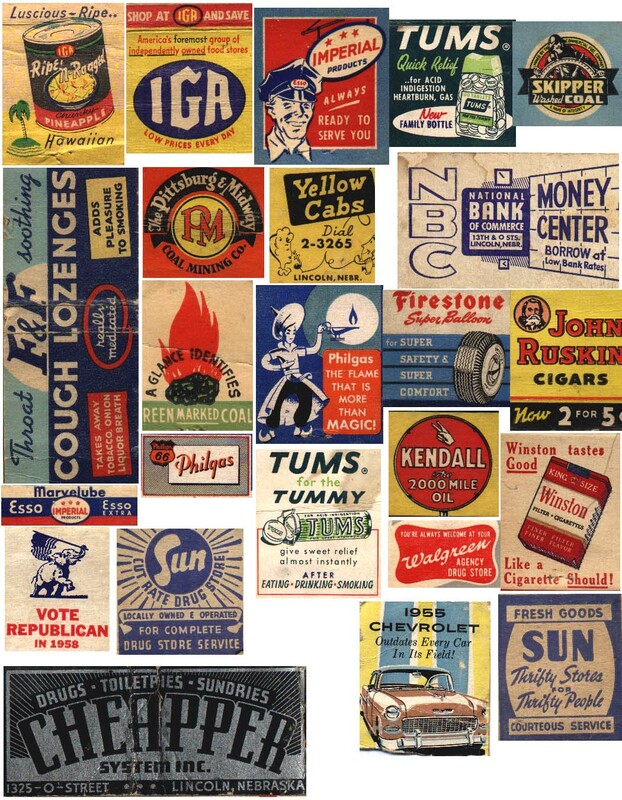 40s and 50s posters - Includes 164 signs & posters. Click on the image to see full size. Unfortunately for Large Scale railroaders, the graphics on this image (as originally provided by James Powell) are very small. But they may be useful for smaller scales. Right click on the big image and choose 'Save Picture As...' or 'Save Image as....' to save the image to your hard disk. Note: Family Garden Trains™, Garden Train Store™, Big Christmas Trains™, BIG Indoor Trains™, and BIG Train Store™ are trademarks of Breakthrough Communications (www.btcomm.com). All information, data, text, and illustrations on this web site are Copyright (c) 1999, 2000, 2001, 2002, 2003, 2004, 2005, 2006, 2007, 2008, 2009, 2010, 2011, 2012, 2013, 2014 by Paul D. Race. Reuse or republication without prior written permission is specifically forbidden.